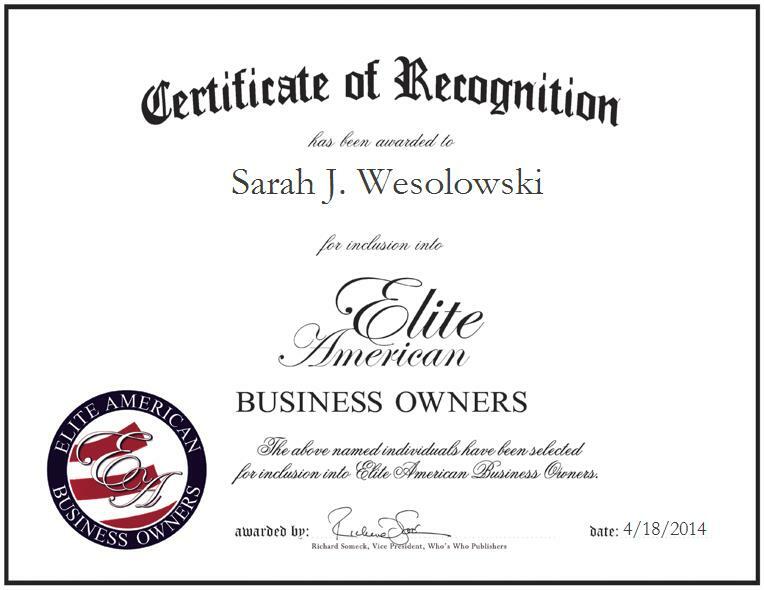 GREENFIELD, MA, April 18, 2014, Sarah J. Wesolowski, Enrolled Agent and Master Tax Adviser of Sarah’s Bookkeeping, has been recognized by Elite American Business Owners for dedication, achievements and leadership in bookkeeping and tax services. After working as an employment consultant for individuals with disabilities, Ms. Wesolowski decided she needed a change. She completed a course with H&R Block and the company offered her a position. Ms. Wesolowski started working for the company in November 2002 and continues to lend her talents to the business while also running Sarah’s Bookkeeping. Ms. Wesolowski established her company in June 2007 and has worked with clients who need assistance with their taxes and bookkeeping. An expert in working with startup companies and developing business, Ms. Wesolowski is responsible for representing clients with the IRS if there are issues, bookkeeping for a martial arts organization, which she branded and helped with business development, and conducting bookkeeping maintenance for her company. She attributes her success to caring about her clients. Additionally, she considers her hard work and education to be especially beneficial, as it helped ensure her capability. In the coming years, Ms. Wesolowski would like to complete a CPA certification and the Bachelor of Arts degree she is pursuing at Everest University.